Let me preface this by saying I'm the type of person who always feels the need to alter at least one aspect of any article of clothing to really "make it my own." That said, when it comes to denim, there's one super-simple DIY trick I obsessively do to every pair in my arsenal. I assure you, it's just as easy (if not easier) than you'd think to achieve what I call ripped jeans 2.0. Essentially, cutting off the hem of my jeans creates a raw edge with just the right amount of distressing to where they have a laid-back look but can still be dressed up. While cutting off the hem isn't an exact science, this is typically how I go about creating my ideal amount of distressing: First, try on the jeans and decide where you want the hem to fall on you. Are you going for a cropped look? Aiming to keep their length intact? Mark off half an inch below your desired hem and then lay the jeans on a flat surface and turn them inside out. Now, cut away. The edge won't be as frayed right away, so you can either pull at the loose threads to give it more distressing or throw them in the wash for the same effect. Just in case you may have needed a bit more convincing on wearing ripped jeans, I'm sharing the outfits I always keep in my "saved" folder just below. But maybe you trust a brand more than yourself to fray your jeans' hems, in which case I've shopped the essential pairs you need to get started on the look. Style Notes: Re-create my look in under two minutes. All you'll need are a pair of jeans to work with, scissors, and an unwavering eye. Style Notes: Doubling up on the denim is a styling trick as old as time (probably). Add a bit more interest to the tried-and-true combo when you opt for a pair of raw-edge jeans. Style Notes: With a blazer and stiletto pumps, your distressed jeans will be far from unpolished. Style Notes: More than on board with distressing your jeans this way? Take the next step by trying out XL fraying. The extra few inches on the bottom create an eye-catching texture. 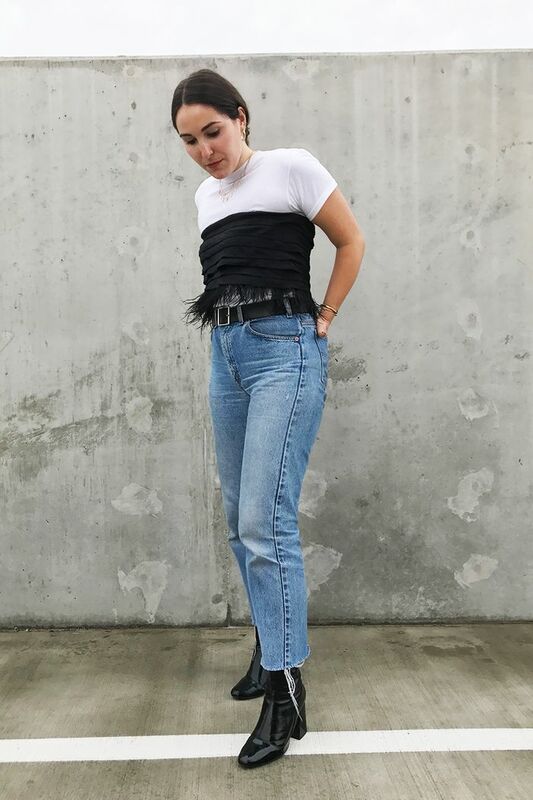 Style Notes: Another one of my favorite styling tricks is wearing patent boots with the denim as an interesting backdrop for the jeans' frayed edge. Style Notes: I'm intrigued by the contrast between the raw-edge denim and her floaty dress in this look. Style Notes: For maximum effect, try a darker wash denim that creates a high-contrast effect when the edges are heavily ripped. Style Notes: This look may be more forward than many of us are ready for, but that's what I love most about it. Because she's wearing long, oversized denim shorts over her pants, the fraying at the edge really comes to life. Style Notes: When in doubt, sock boots are always the answer for this type of ripped jeans. The raw hem creates an interesting appeal contrasted by the ankle-hugging boots. A cropped pair lets the frayed edge take up all the attention. This pair features a pretty asymmetrical hemline. The XL cuff is what makes this pair stand out. Split-hem jeans are the perfect opportunity to showcase a pair of ankle boots. The exposed seaming on this pair balances out the frayed edges nicely. Just the right amount of distressing. This throwback pair is quickly gaining ground among the fashion crowd. Now you're in on my secret to giving all my jeans just the right amount of distressing.